Śākyamuni ("Sage of the Śākyas") was a spiritual teacher who founded Buddhism. 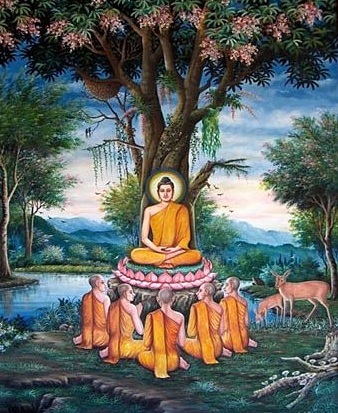 In most Buddhist traditions, he is regarded as the Supreme Buddha of our age. "Buddha" means "awakened one" or "the enlightened one." "If he will but listen intently to everyday sounds, he will come to realization and at that instant see the very Source. These six senses are no different from this true Source. In every activity the Source is manifestly present. It is analogous to the salt in water or the binder in paint. When the inner vision is properly focused, one comes to realize that that which is seen is identical with the true Source." Any world is an illusion. Even the world we think we have now is not possible - how can it then be said to be real? In Truth, no particular world can exist. In Truth, any world would be unreal. Truth is the only reality and is beyond words. Truth is not just possible, but is real. It is here already - where else could It be? 'Here' is infinite and is now. 'Now' is eternal and is here. - However, neither space nor time can be said to exist or not to exist. Truth essentially is beyond them both and is unborn and imperishable. Although Truth requires no work, some of us may want to work hard to see this clearly. Looking inward, we will have to do this solitary work ourselves. Johann Sebastian Bach: "Nun, Komm der heiden Heiland"